The library now provides a variety of classic titles through One Click Digital. Listen to one of the 200 different eAudiobooks available, or read one of the 85 eBooks available for checkout. These titles can be accessed at: http://mlcmo.oneclickdigital.com/Home/Featured.aspx. One feature of the One Click Digital collection is that titles are always available, so there are never holds or waiting periods for any of the titles. You can search for specific titles, or you can choose to browse the collection. Clicking on the magnifying glass next to “Browse” will show you all the titles in the collection. When you have found a title you are interested in, click on the cover. If there is an eBook format available for the title, it will be shown on this page. Click on “Checkout now!” next to the format you are interested in borrowing. To create your account you’ll need your library card number and an e-mail address. After you’ve filled out your personal information and created a user name and password, your book will be checked out. To listen to audiobooks on your computer, you will need to download One Click digital Media Manager (available for Windows and Mac). Click on install, and follow the Setup Wizard when prompted. When the Media Manager opens, sign in with the username and password that you created for One Click digital. Any eAudiobooks that you have selected will appear in the library. Audiobooks can be transferred to compatible devices from your computer. To read eBooks on your computer you will need to download Adobe Digital Editions. Adobe Digital Editions is available for download on PC and Mac computers. After you have selected the appropriate download for your computer, follow the instructions from the set-up wizard to complete the download. If you do not already have an Adobe Digital Editions ID (different than an Adobe ID), you can sign up for one by clicking on “Create an Adobe ID.” After you have created your ID (your computer will only have to be authorized once), sign in and you books will be ready for download. If you would like to transfer your eBook to another device, click here to find out which devices are compatible with Adobe Digital Editions. The One Click digital eAudio app is available for Android, Kindle Fire, NOOK, iPhone, iPad Touch and iPad users. The app can be found in your app store, or by clicking here. 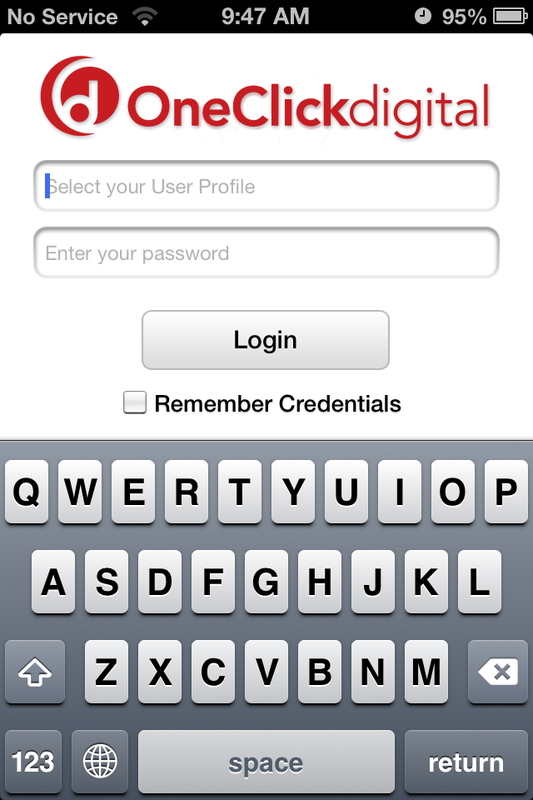 After the app has been downloaded, login using the username and password you created when setting up your One Click Digital account. You can access your account from the app to download current checkouts, renew, and search for new titles. eAudiobooks that are currently checked out to you can be accessed by clicking on the play button next to the title. You can choose to download all titles at once by clicking on “Download All” at the bottom of the screen. There is a separate app available for Android, Kindle Fire, NOOK, iPhone, iPad Touch and iPad users called One Click digital eReader. *If you are interested in listening to eAudiobooks and reading eBooks on your device, you must download both apps to access your titles. 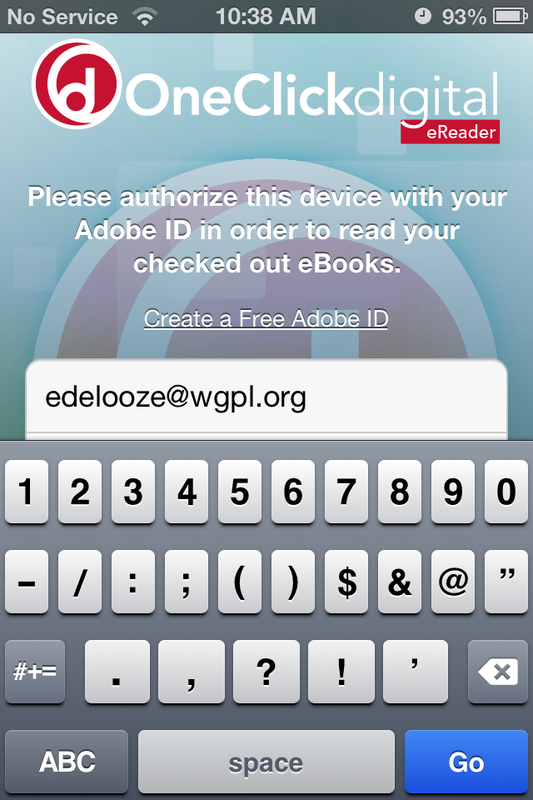 After you’ve created an Adobe ID and signed into your One Click digital account, you’ll have access to books you have checked out. 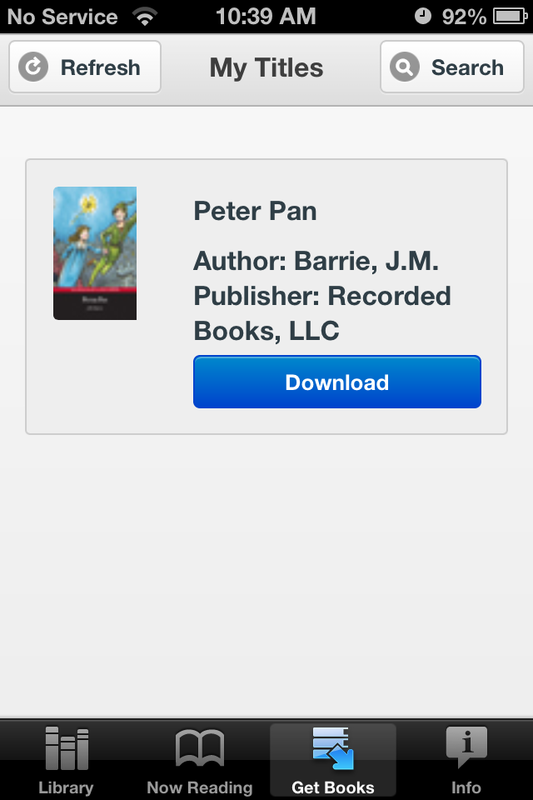 Tapping on “Download” will load the eBook onto your device. Click on “Get Books” at the bottom of the screen to browse and check out other books in the collection. If you have problems with One Click Digital, help is available at 877-77AUDIO or support@oneclickdigital.com.